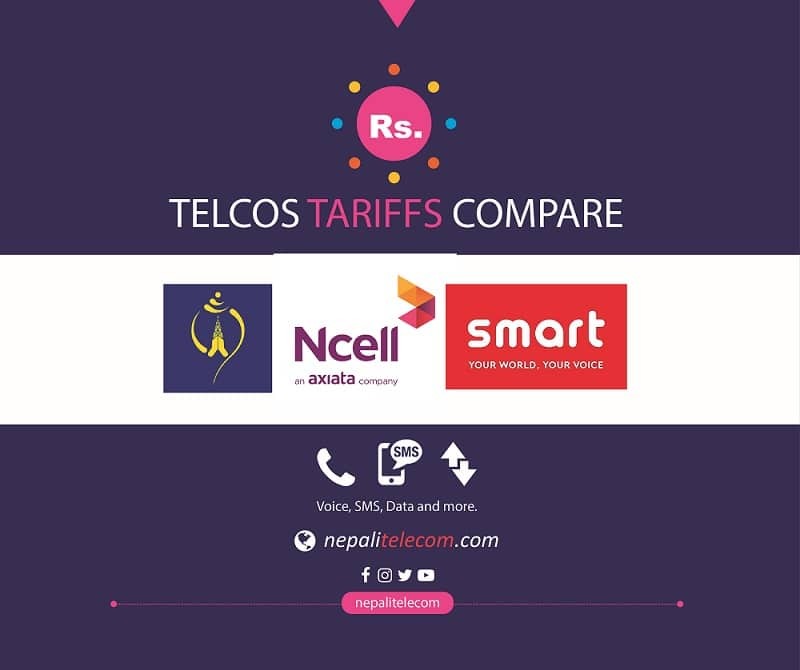 After the implementation of TSC (Telecom service charge) for internet service, Ncell has informed of price revision for their data packs. The price of the Ncell data packs now includes the additional tax ( 13 % TSC and 13 % VAT on top of that). Here we mention the Ncell revised data packs like Sahi data packs, Daami data packs, Ramro data packs, Ncell unlimited packs. This is the NcellI new data packs which also includes the Ncell Fb packs and Ncell unlimited data packs. In all those Ncell new data packs, previously the total price was inclusive of the applicable taxes. Now after the new provision, Ncell separates the original tariff and the government taxes (TSC+VAT). Here we find that the government tax is 27.7 percent of the data tariff. Ncell revises the old Sahi data packs with the same original price but with more additional volume. As the government tax adds on top of the original data tariff, the data packs price feels expensive. For example: 39 Rs data pack valid for a day used to provide 0.5 GB of data but now it is revised as (Rs 39 +10.8= Rs 49.8) for 0.75 GB data. They are also providing an additional 1-hour free video streaming for each of the data packs. The free video streaming is available with YouTube Go apps. 1-hour video streaming also works with YouTube, Netflix, all Ncell video portals and other Google services like Google Play, Maps, etc. After the consumption of the sahi data packs, the customer can browse the internet at just Rs.1 per MB (exclusive of taxes) until the validity of the packs. The data tariff after the consumption of 30 day daami data packs is Rs 1 per MB. Whereas for other daami data packs, the price after consumption is Rs 3 per MB. Ncell ramro data packs provides data volume in 3G/ 4G and additional data volume of the same in 4G only. The 4G data only works with 4G supported SIM and handset, in areas where the 4G network is available. The data tariff after the consumption of 30 days daami data packs is Rs 1 per MB. Whereas for other daami data packs, the price after consumption is Rs 3 per MB. dialing *17123# and select the packs that suit you. Ncell data tariff without data packs. Here is the tariff of Ncell internet data on the go, that means without any data packs. Ncell FB packs can be used for all time with bonus Facebook data for the night time. Customers can update FB status, chat, message, upload and share pictures, watch Facebook videos (and not from YouTube and other third party sites) and do everything on Facebook with the Facebook pack. It only allows Facebook pack via official Android and iOS apps and through m.facebook.com in laptop and other devices. The Facebook pack is now also available in Opera Mini 4.4 and above. After the consumption of FB data packs, customers can use Facebook at Rs 0.99 / MB within pack validity period. The Ncell Facebook pack can be subscribed by dialing *17115# and choosing the pack of your choice. Ncell unlimited data packs allow unlimited internet for a period of 30 days at a fixed price. Here for this unlimited data pack, Fair Usage Policy (FUP) applies. For the unlimited data packs with the specified volume, the data speed remains as the 3G speed. After the consumption of the specified volume (like 1 GB), the speed falls back to 32 kbps for the rest of the pack validity. With Ncell connect, subscribers can use the Ncell cellular network in their desktop computer or laptop or tablet. Ncell provides a USB dongle of the name Ncell connect. Here are the data packs available for Ncell connect. to send a message of the format “Volume of the pack” to 9009. Like for example, to subscribe 500 MB Ncell connect data, subscribers need to send a message 500MB to 9009.
send a message status to 9009. If you want to know more information about the revised Ncell data packs, comment below. Mobile data tariff not revised although Home internet tariff rise revoked.